Chelsie continued her GST journey and began working in January 2016 towards her goal of competing in a figure competition. She competed in NPC’s Battle At The Falls and took 3rd place in her class. She’s currently off season and enjoying her time off as she considers a Spring 2017 show. 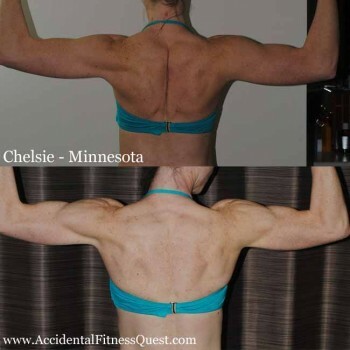 Chelsie is an online training and nutrition client located in Minnesota. Read what she has to say about working with me and the results she’s gotten through her Growth Stimulus Training experience and nutrition program. She’s currently following a training and nutrition program to lean out while maintaining her muscle, improve her strength, and perfect her physique. Chelsie’s Before and After pictures span a 10 1/2 week timeframe and show what is possible to achieve with the right nutrition and a proven program to retain, or even build muscle, while dieting. In the 16 weeks that I’ve worked with her, she’s leaned up and is down almost 21 lbs. Her dietary and workout compliance is spot on and paying off with a gorgeous pair of arms and a physique to be proud of . Adrianne – you are doing and have done everything I could have ever hoped for in a coach/client relationship. You have been amazing and though we have never met face to face I feel like I’ve known you forever! Just keep being the amazing coach that you are! I love the nearly instant feedback/response to questions or struggles and even success. Keep it up! Ryan but I can honestly say that I am so glad he assigned me to you!! I love working with another female! I could tell from the very beginning that you cared not only about my success in the GST program but about me as a whole person. I never expected to have my nutrition and workout coach know so much about me but I love that you genuinely cared about my whole person and not just my nutrition and fitness goals. To lean out my lower half. To see a certain number on the scale. I am having SO MUCH FUN with the different food combinations. I love the challenge of increased weights in the gym and finding that I can do it! Working with Adrianne has been a dream come true and as long as someone is ready to dedicate themselves to long term health and wellness they will be 100% successful with Adrianne as their coach! !